It has been an amazing year, starting with the winter Olympics in Pyeongchang, with two African safaris and a trip to the rain forest of Costa Rica in the middle of the year, and ending with a trip to Hawaii. I have compiled all of my favorite photos in this 4 minute video. I hope you enjoy it! Click the image above to watch the video in full resolution. I hope that all of you have an amazing 2019 that is full of excitement and great photo opportunities! While in on the island of Kauai a couple of weeks ago, I was anxious to take a helicopter ride to capture some aerial photos. But I have tried photographing through small aircraft and helicopter windows before, with mixed results. I only wanted to do so if I could find a company willing to let me fly with the doors removed. After calling around, I was happy to find out that some of the local helicopter tour companies did offer "doors off" charters. I scheduled a ride for our last full day on the island. Luckily, the other photographer (Tom) who I had met a couple of days before, had just taken the same flight and reconfirmed my choice of lens and camera settings. As is always the case, these flights are weather dependent, so I had to wait until the following day to see if the flight was happening or not. I woke up to pretty clear skies and the flight was a go. After a couple of safety briefings, I was all set to go. I decided to take up my Canon 1D X Mark II and a Canon 24-105mm lens. I figured that I might want the faster frame rate of this camera, but ended shooting all the images at a medium burst rate, so any of my Canon cameras would have worked. The 24-105mm focal length worked perfectly for getting wide shots and good close-ups as well. We took off from Lihue airport and flew inland towards the mountains. Since it rains so much on Kauai, there are an abundance of waterfalls on the island. I took this first shot once this waterfall was in sight. A couple of seconds later, we flew into a position where I could see the pool at the bottom of the waterfall, and I zoomed in a little closer and took this shot. * The helicopter is moving at 100mph, which makes it hard to keep the camera steady when holding the camera outside the chopper. * There is a lot of vibration from the rotors and the outside weather conditions. * The lighting is constantly changing, requiring camera settings to be changed frequently. * Quite often the rotor blades are in the shot, so it helps to aim low with the camera. I also shot in burst mode to try and get a shot with no rotor in the shot. Some images required me using Photoshop to remove the blade from the photo. This one minute video below will show you some of the challenges I was dealing with. You will see the changing light conditions, the vibrations and even the rotors (towards the end of the video). * I tried to keep the camera pointing down under the rotors, but high enough not to get the bottom of the chopper in the frame. * I did use Adobe Photoshop to remove the blade from some photos. * I tried to keep my shutter speed over 1/1000 sec to get sharp images even with the all the movement. * I was adjusting my ISO when pointing in very dark or very light scenes. We flew over Waimea Canyon which is the Grand Canyon of the Pacific. I loved the variations in the terrain and color. There were numerous times when we saw rainbows, making for some really nice photos. For the latter part of the flight, we flew along the Napali Coast and took in the amazing landscape. I took many photos as we flew over the deep blue water and along the red and green coastline. And here is a similar shot without the helicopter, which highlights the colors in the ocean more than in the previous photo. The coastline of Kauai is just spectacular. Even in muted light, the formations are breathtaking. Another rainbow, this time over the Napali Coast. For the last part of the flight, we flew over the wettest part of the island. This also happens to be one of the wettest spots on Earth, with measured rainfall at over 450 inches per year. Seriously! Waterfalls are everywhere. We were flying back towards the airport when I saw that the late afternoon sun was hitting just the tops of these mountains. So pretty. 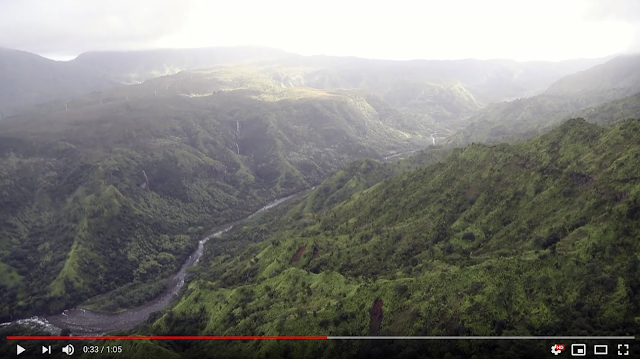 Just before we landed, we flew over the Wailua Falls, which were made famous during the opening credits of the television series "Fantasy Island". This was my third "doors off" flight and it was another fantastic experience. Not only did it let me experience the beauty of Kauai from the best perspective, but it also let me capture these images to share with all of you. After photographing the wedding on Maui, my wife and I flew to the island of Kauai for a much needed 4 days of vacation. It has been a really long time since I have been on Kauai and I was excited to get back. We landed on Sunday afternoon, went to the hotel and basically just relaxed for the day. After working all weekend, it was nice to just kick back, have a couple of Mai Tai drinks and do nothing. The next day, we woke up to high winds and rain. Not exactly what you would want in Hawaii, but we decided to get out and make the most of our time on the island. We walked down to breakfast, and I brought my camera gear and tripod with me. A gentlemen who was sitting near us, saw the tripod and told us that he was on the island to take photos as well. He and I started talking photos and sharing ideas of where we wanted to shoot. He told us about a grove of rainbow eucalyptus tress that were nearby, and my wife and I thought that would be a good place to visit. After finishing our breakfast we headed out. It didn't take too long to drive to the trees, but as soon as we parked and I went to get out of the car, the rain started dumping down. I jumped back in the car and waited it out. As is usually the case in Kauai, 5 minutes later and it stopped raining. The good news is that the wetness of the trees helped bring out even more color in the bark. Amongst the rainbow eucalyptus trees, there was plenty of other foliage. I really loved the patterns of moss growing on this one tree, which was nicely nestled with all these ferns. We walked around the trees and took a lot of photos. Me with the Canon 100-400mm lens mounted on my Canon 5D Mark IV and my wife with her iPhone. The colors in the bark were just amazing! As we were driving down the road back towards the hotel, we saw this grove of trees on a nearby monastery property. After waiting for the rain to subside once again, we got out and roamed in this area. I was shooting photos of the tree trunks when this rooster came nearby. I said to my wife "I need this rooster to go dead center in my photo" and sure enough, he did just that! I switched to the Canon 24-105mm lens and got low to the tree roots to get this shot. Since we were right by the monastery, we decided to walk around and check it out. This is the view from the back of the monastery. Not too shabby. Also on the same road, we stopped by these waterfalls. Using the low light from the rainy day, I set my ISO to 50 and my aperture to f/36 to give me a slow shutter speed of 1/4 second. I wanted to capture the motion of the water and also to capture the nearby branches blowing in the wind. For the second half of the day, we drove around the Poipu area of the island. It is in this area where you can find the water spout. Again, I used the muted light to get a slow shutter speed for the blow of the water. The next morning, we woke up to overcast skies once again, but signs that we might see sunlight. From our balcony, we watched these windsurfers going back and forth in the ocean. I took some photos at high speed but then kept with the slow shutter theme of the trip and started shooting images at 1/6th of a second. I panned along with this guy until I got a sharp image. We decided to spend the day driving up North, towards the town of Princeville. Along the drive, we diverted off to some side roads and found some beautiful views, like these converging orange and yellow flowered trees. The sun was starting to come out and the light was just too perfect on this tree not to stop and take some photos. Right by the tree (in the previous photo), there was this grove of trees all in row. I liked the way that this one "random tree" existed in front of the order of the others. Eventually, we made our way up to the Kilauea Lighthouse, and the sun finally came out! This lighthouse is more than 100 years old. We were walking along the pathway on Kilauea Point, admiring the views when I spotted this butterfly. My wife was admiring the great markings on the outside of the wings, so I worked hard to capture an image with both the top and underside of the wings in the photo. It still amazes me how well the newer Canon 100-400mm lens can focus almost at macro distances. The next day we drive to some other water falls on the island. This particular one is famous for being featured on the old show "Fantasy Island". Kauai is well known for the amount of wild roosters and hens that roam the island. The tourists see them as a great photo opportunity, but the locals are not too thrilled with them. I saw this one hop up on a rock, with a killer view of the valley below. It was too good a pose not to photograph. This rooster climbed up on a tree stump and started crowing. I think it was jealous that I spent so much time photographing it's buddy and was crying for attention. On our second to last day on the island, I took a helicopter ride with the doors off, and captured some really cool aerial shots, but that blog is coming next. I took this last photo on the morning that we flew home. We woke up to see the sun rising amongst the clouds. It was a beautiful view to start our last couple of hours in Hawaii. Photographing a destination wedding in Hawaii - Rain or shine! I just returned home from a week in Hawaii. I know, life is tough! Even though this is an awesome vacation place, we were actually there for work. Last year, I was hired to shoot this wedding on the island of Maui, and after a long wait, we had a chance to work our magic on the island. I had loaded my Thinktank rolling carry on bag and rolling backpack with my Canon 1D X Mark II, Canon 5D Mark IV and even one extra Canon 5D Mark III as a backup. I also loaded many Canon 600EX-RT flash units and MagMod modifiers for the trip. I had pre-charged a ton of the Powerex AA rechargeable batteries for the flashes, and brought the Maha charger for future recharging. Both of those bags were carried onboard the plane while our suitcases were checked. My wife, Annette, and I arrived on the island on Thursday afternoon, with all the cameras, flashes intact and ready to go. We met up with Megan and Anthony on Friday morning for their rehearsal. As you can see from this portrait, we had beautiful weather. Look at that amazingly blue water in the background. I photographed the rehearsal just enough to figure out the best shooting positions and settings. Then we went to lunch with the family where I captured some more informal photos and we got a chance to get to know everyone better. After lunch and a break, the four of us met up for some pre-wedding portraits. My wife and I had already scouted out locations for the shoot, but Megan requested that we stop by this row of trees for some shots before heading to the beach. The lighting was not great, so I shot mostly tight shots. I was very happy to have have some clouds in the sky to add drama to the scene. I had my wife moving to different positions around the couple with the lights, all while trying to keep the light from the flash on them, but not too much on the rocks. We suggested that they turn away from us and enjoy the sunset. Looking at the LCD of the Canon 5D Mark IV, I was really excited to see what we were getting. I jammed back to our hotel and retouched a handful of these images. I couldn't wait to share some of these with Megan and Anthony. We arrived at Megan's hotel suite at 7:15am to get photos of her getting ready, and to get detail shots of the rings, bouquet, shoes and more. I thought it would be cool to get some photos of the rings with the Hawaiian islands in the background. In order to get this shot, we put an end table on top of a chair to get up over the balcony railing. My wife then placed part of her dress on the end table and positioned the flowers and rings. After getting our detail shots, I went back to photographing the bride getting ready. I had her stand by the window to get this window light shot. My plan was to head over to the groom's room to get some shots of him getting ready, but then was told that there was a nice rainbow outside. I ran to the other side of the hotel to get some shots of the rainbow to use as a backdrop in their album. Then I went to capture images of Anthony. After all the pre-wedding photos, we drove over to Merriman's for the couple's first look and wedding. Annette and I had looked all around the venue for a good place for the first look, and determined that this wall was our best bet. We had Anthony stand behind this one wall to wait for Megan. And just as we did this, the rain started to fall. They saw each other for the first time and had some time together, while I stood back and captured the moment. If you look closely, you can see the rain drops coming down. The wedding was all set up to go at 10am, but due to the rain, the people at Merriman's delayed the ceremony to see if we could get a clearing in the weather. In the mean time, I saw this rainbow in the background and thought that it made the perfect background for a venue shot. Megan was downstairs protected from the rain and waiting for everyone to get seated. I ran up and got Anthony for this shot with the rainbow. After another 15 minutes, Tino (their officiant) blew the conch shell to signify the start of the wedding. As you can see, everything was a bit wet, but the wedding went on without anyone caring about the weather. Everyone actually laughed about it. Megan and Anthony were pronounced husband and wife! After the rain slowed, everyone emerged from cover and we did all the formal photos of the wedding party and families. As I was finishing the last photos of the families, my wife was gathering up everyone who flew in for the big day. We got them out on the grass, and even with the rain coming down, everyone got into the group photo and celebrated with the new bride and groom. The wedding was over by 2:30pm and everyone went back to the hotel to relax. Megan put a huge importance on her wedding photos, and asked if we could do more photos later in the day. If you know me, you know that I am always up for taking photos. Especially with a fun couple in an amazing location. So, at 4:30pm, my wife and I picked them up and we went out hoping that the weather would cooperate for one more sunset shoot. But this time, with the cloud cover, we drove back to the tree lined road in Kaanapali and got some nice wide shots of the them. This is a shot that the bride's mother really wanted, and I hate disappointing anyone! My wife was lighting the couple with one Canon 600EX-RT flash from my right, adding just the right amount of light to make them stand out from the rest of the scene. The rain held off and we had a pretty sunset once again. Megan was a total trooper and traversed the rocks in her wedding dress. Once again, Annette was holding two Canon flashes with the MagGels and we captured the newly married couple in this epic environment. Annette held on to Megan's veil while I shot this photo holding one flash in my left held and the Canon 5D Mark IV in my right hand. We shot a couple more shots until the sun dropped and sky lost most of it's color. We were traversing the rocks back towards grass when I saw these clouds lighting up behind them. I said "wait - let's do just one more shot!" and they were game. They raised their hands in celebration of an amazing day, their new nuptials, and our rainless last photo shoot. It really was a perfect ending to an epic wedding. The next morning, we packed up everything and Annette and I flew to Kauai for 4 days of rest and relaxation. That blog is coming soon.